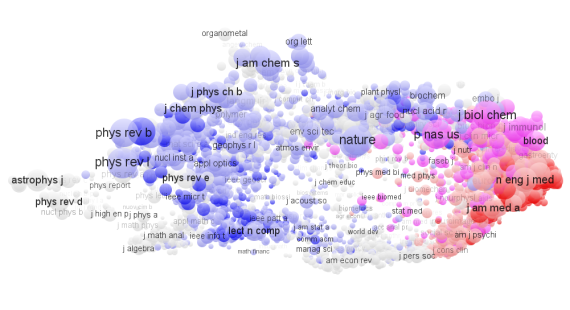 World science, as labeled by JAD categories, clearly shows a divide between clinical relevance to the right (within medical and life sciences) and industrial relevance to the left (natural sciences and engineering sciences). The interface between both application domains, industrial-clinical relevance (biopharmaceutical relevant fields), is also found at the right hand side of the map, where it is closely tied into the medical and life sciences. Click here to access the interactive map and to check the clinical and industrial relevance scores (i.e., % general hospital addresses and % corporate addresses) of individual journals.